This book examines how inter- and intra-party coalition-building affects governability in South Korea. Focusing on the Kim Dae-jung administration (1998-2003) as a case study in the failure of a government to turn electoral success into stable governability, or ability to implement reform policies, the book’s research draws on two bodies of literature which, though focusing on the same dependent variable (cabinet or government stability), have rarely been used in tandem: coalition research on parliamentary systems and studies of divided government in presidential systems. Youngmi Kim argues that a weak institutionalization of the ruling party and the party-system accounts for political instability and inefficient governability in Korea and in doing so her study makes a number of key contributions to the field. Theoretically it proposes a framework which integrates a rationalist approach with one that acknowledges the role of political culture. It further enhances the understanding of factors affecting governability after coalition-building across regime types and aims to build on recent demands for broader cross-regime analysis of minority/divided government and of the determinants of governability. This has important comparative implications as coalition-building within (semi-) presidential systems has occurred in other post-authoritarian contexts. The book finally provides a new dataset which fills a gap in a field where Western cases constitute the main focus of research. 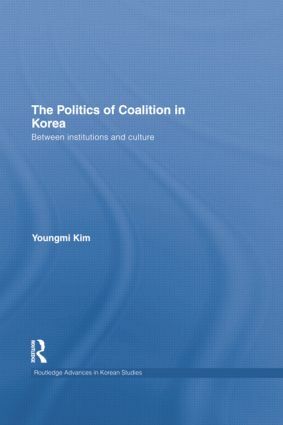 The Politics of Coalition in Korea will be of interest to students and scholars of Korean studies, Korean politics, Asian studies and Asian politics. Youngmi Kim is Assistant Professor at the Departments of Public Policy, and International Relations and European Studies at Central European University, Budapest, Hungary. Youngmi Kim is an Assistant Professor in the Department of Public Policy, and International Relations and European Studies at Central European University, Hungary.